Scientists are now using quasars to probe the mysteries of dark energy that existed over 10 billion years in the past. "We are seeing back to the matter-dominated universe, when expansion was decelerating and dark energy was hard to see," says Martin White, professor of physics and astronomy at the University of California, Berkeley. "The transition from decelerating expansion to accelerating expansion was a sharp one, and now we live in a universe dominated by dark energy. The biggest puzzle in cosmology is, why now?" The Baryon Oscillation Spectroscopic Survey (BOSS), is mapping a huge volume of space to measure the role of dark energy in the evolution of the universe. BOSS is the largest program of the third Sloan Digital Sky Survey (SDSS-III) and has just announced the first major result of a new mapping technique, based on the spectra of over 48,000 quasars with redshifts up to 3.5, meaning that light left these active galaxies up to 11.5 billion years in the past. The X-ray image above shows the quasar PKS 1127-145, a highly luminous source of X-rays and visible light located about 10 billion light years from Earth. Its X-ray jet extends at least a million light years from the quasar. "No technique for dark energy research has been able to probe this ancient era before, a time when matter was still dense enough for gravity to slow the expansion of the universe, and the influence of dark energy hadn't yet been felt," says BOSS principal investigator David Schlegel, an astrophysicist in the Physics Division of the U.S. Department of Energy's Lawrence Berkeley National Laboratory (Berkeley Lab). "In our own time, expansion is accelerating because the universe is dominated by dark energy. How dark energy effected the transition from deceleration to acceleration is one of the most challenging questions in cosmology." Two ways to measure the expanding universe As an international collaboration, many of whose leading scientists are present or former members of Berkeley Lab, BOSS studies dark energy by mapping baryon acoustic oscillations (BAO) – the large-scale network of variations in the distribution of visible galaxies and hard-to-see clouds of intergalactic gas, which also reveal impossible-to-see dark matter. The regular spacing of peaks in matter density originated in primordial density variations, whose remnants are visible in the cosmic microwave background radiation. This spacing provides a cosmic ruler for calibrating the rate of expansion wherever BAO can be measured. Using the Sloan Foundation Telescope at the Apache Point Observatory in New Mexico, BOSS has mounted a two-pronged spectroscopic investigation of BAO. The first priority is to survey normal bright galaxies with redshifts up to 0.8, some seven billion years in the past; first results of the galaxy survey, which included over 300,000 galaxies, were announced in March, 2012. But collecting enough galaxies at redshifts high enough to map BAO in the very early universe can't be done with a 2.5-meter telescope. Thus BOSS's second target: quasars. "Quasars are the brightest objects in the sky, and therefore the only credible way to measure spectra out to redshift 2.0 and beyond," says Schlegel. "At these redshifts there are a hundred times more galaxies than quasars, but they're too faint to use for BAO." Quasars are too sparse to measure BAO directly, but there's another way they reveal BAO at high redshifts. As the light of a quasar passes through clouds of intergalactic gas on its way to Earth, its spectrum develops a plethora of hydrogen absorption lines known as a Lyman-alpha forest. Ideally, each absorption line in the "forest" reveals where the quasar's light has passed through an intervening gas cloud. Like a single flashlight seen through the fog, the different prominences and redshifts of the individual absorption lines in a single quasar's spectrum reveal how the gas density varies with distance along the line of sight. "When I presented this idea to a conference of cosmologists in 2003, they thought it was crazy," says White, who is also the chair of the BOSS science survey teams. "Nine years later, BOSS has shown that it's an amazingly powerful technique. It has succeeded beyond our wildest dreams." Until recently, three-dimensional maps by BOSS (red dot, right of center) and other surveys were able to measure the regular distribution of galaxies back to an average of only about five and a half billion years ago, a time when the expansion of the universe was already accelerating. 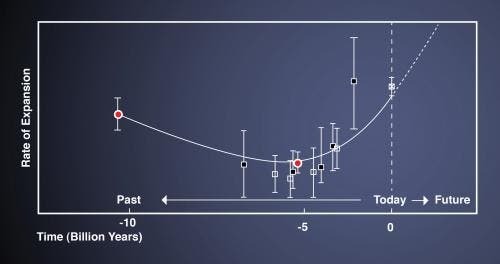 BOSS's quasar measurements (red dot, left), by measuring the distribution of intergalactic gas, have now probed the structure of the early universe at a time when expansion was still slowing under the influence of gravity. The quasar data gives new access to the transition from deceleration to acceleration caused by dark energy. (Graph by Zosia Rostomian, Lawrence Berkeley national Laboratory, and Nic Ross, BOSS Lyman-alpha team, Berkeley Lab). SDSS-III's far more sophisticated spectrograph, whose construction was directed by Berkeley Lab's Natalie Roe, allows much better coverage and resolution than earlier surveys, but searching for BAO in the Lyman-alpha forest was still a high-risk proposition for many reasons. Lyman-alpha absorption lines occur in the ultraviolet part of the spectrum, which is absorbed by Earth's atmosphere; from the ground, only those quasars whose spectra are redshifted the right amount are useful. The lines tag only neutral hydrogen; most hydrogen in the universe is ionized. Among other uncertainties, irregular heating of hydrogen clouds, or too many quasars too close together, could distort the clustering signal. "Compared to a galaxy survey, looking for BAO in the Lyman-alpha forest is cool – high-risk, but high-reward," says Berkeley Lab's Nicholas Ross, who led the target selection team. To catch enough quasar spectra to map clustering – a minimum of 15 to 20 quasars per square degree of the sky – BOSS would have to devote 10 percent of the two million individual targets during its five-year run to possible quasars. The targets had to be chosen from photometric data (an object's brightness in different colors), but only after the spectra were taken would the team be sure which targets were real quasars and which were stars or some other quasar mimic. BOSS took the chance. "We had one thing in our favor," Ross says. "It didn't matter what type of quasar it was, as long as it was high redshift. To identify them we could use ultraviolet data, near-infrared data – any method, any trick – because we were only going to use them as backlights to probe the intervening clouds of gas. Ultimately we found that all our selection algorithms worked well." *Searching for the signal The initial Lyman-alpha result – the first map of BAO at this very early stage of the universe's evolution – is based on just a third of the volume of space that BOSS will ultimately map, and includes 60,369 quasars confirmed by visual inspection of their spectra. But to simplify the search for BAO, many of these were discarded. "To get BAO out of the data, we have to remove artifacts that distort the signal we're looking for," says Berkeley Lab's Bill Carithers. One class of rejects is broad-absorption line quasars, whose spectra have been smeared out by extremely fast-moving gas from the quasar's active center. 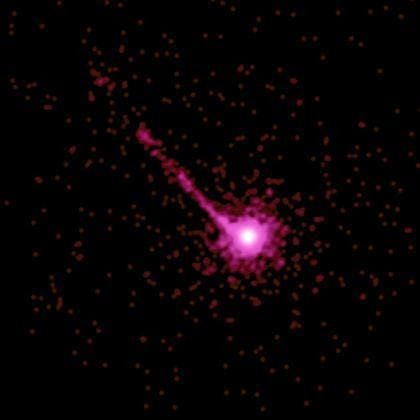 Another class are quasars whose spectra have "damped Lyman-alpha troughs," which happens, Carithers says, "when the light from the quasar runs into a very, very large clump of gas, so large it wipes out the forest." With unhelpful spectra removed, BOSS was left with 48,129 quasars. In May of 2011, a team led by Anže Slosar of Brookhaven National Laboratory, formerly at Berkeley Lab, had demonstrated the practicality of measuring the varying density of intergalactic hydrogen gas at cosmological distances using just 14,000 BOSS quasars – enough, said Slosar, "to establish a proof of the concept." "We don't use the specific information in a single line of sight, we look at the correlations among many," says Carithers. "BOSS is the first to do this because we have enough quasars – with too few, you can't see the pattern." In addition to helping convert the raw data from the telescope into useful scientific information, Berkeley Lab's Stephen Bailey was in charge of generating simulated data sets – called "mocks" – to make sure the analysis was dependable. "Mocks are important when you're trying to measure something that's never been measured before," says Bailey. "We know where the real quasars are and we know what the physics of the gas is, but we don't know where the gas is. Our simulations were based on the positions and redshifts of the real quasars, but with mock spectra that gave different gas distributions. If we could see the simulated distribution in one analysis, we should see it in all." 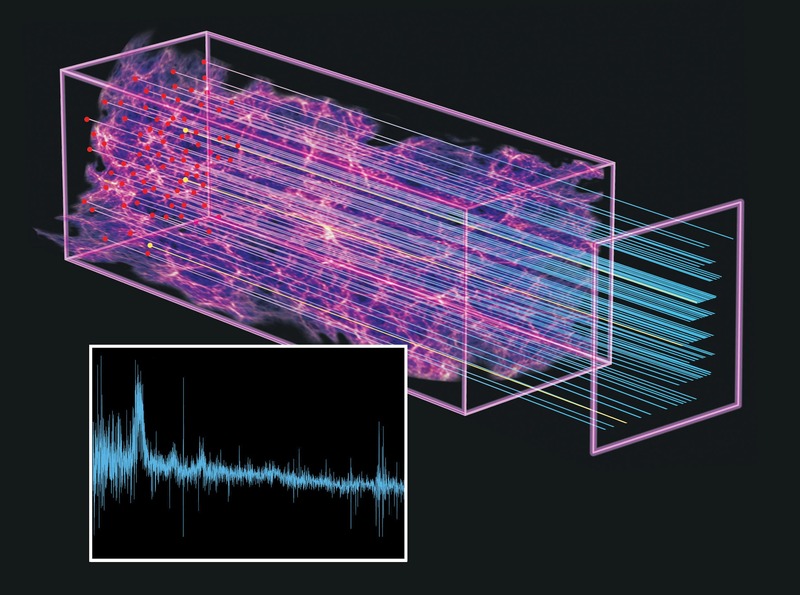 In the end, after data processing and generation of mock spectra on the Riemann Linux cluster of computers provided by Berkeley Lab's High-Performance Computing Services Group, the competing analyses of the Lyman-alpha forest of over 48,000 quasars all gave similar results. The analytic techniques used in this report were developed by Andreu Font-Ribera and his collaborators among BOSS's French Participation Group. Applied to the real quasar spectra, they produced a picture of density distributions that, Bailey says, "gives us a first look at BAO in this previously hidden region." "There is no other credible way we could have measured BAO at redshifts of two or more, says Schlegel. "Five years ago it was chancy, but it was the only proposal on the table. We could have failed in any number of ways, but nature was good to us." It's a question BOSS will go far to illuminate as it collects more than a million and a half galaxies and more than 160,000 quasars before SDSS-III is complete. Meanwhile, the Lyman-alpha forest has opened a new view of the ancient universe, one that may come to full fruition with future, more powerful surveys like the proposed BigBOSS. The image below shows the light from distant quasars (dots at left) is partially absorbed as it passes through clouds of hydrogen gas. A "forest" of hydrogen absorption lines in an individual quasars spectrum (inset) pinpoints denser clumps of gas along the line of sight, and the spectra are collected by the telescopes spectrograph (square at right). Before BOSS, the Sloan Digital Sky Survey had collected spectra from 10 times fewer quasars (yellow dots) per square degree of sky in the accessible redshift range, which corresponds on average to about 10 billion years ago. By measuring the spectra from many more quasars in this range (red dots), BOSS can reconstruct a three-dimensional map of the otherwise invisible gas, revealing the large-scale structure of the early universe. Illustration by Zosia Rostomian, Lawrence Berkeley National Laboratory; Nic Ross, BOSS Lyman-alpha team, Berkeley Lab; and Springel et al, Virgo Consortium and Max Planck Institute for Astrophysics. More information: "Baryon Acoustic Oscillations in the Lyα forest of BOSS quasars," by N.G. Busca et al., has been submitted to Astronomy & Astrophysics and is available on the arXiv preprint server. BigBOSS survey bigboss.lbl.gov/ Journal reference: Astronomy & Astrophysics.